The digital temperature and humidity clock is great for home use. It can be placed on the table. Large colorful LCD display, you can easily read the value. You will love it. °C/°F temperature unit selectable, and 12/24 hour time display selectable. Support weather forecast, sound control function and sense light function. Large colorful LCD display, you can easily read the value. 4-level weather forecast: sunny, semi-sunny, cloudy, rainy. 3 icons for comfort level indicator of indoor air conditions: dry, comfort and wet. Can be placed on the table, fitting for home use. The blue backlight is bright and makes the screen easy to read in low light. Open the voice control switch, you can gently touch it or tap the desktop to trigger the backlight. Backlight automatically turns off after 8 seconds. Large colorful LCD display, you can easily read the value.The blue backlight is bright and makes the screen easy to read in low light. 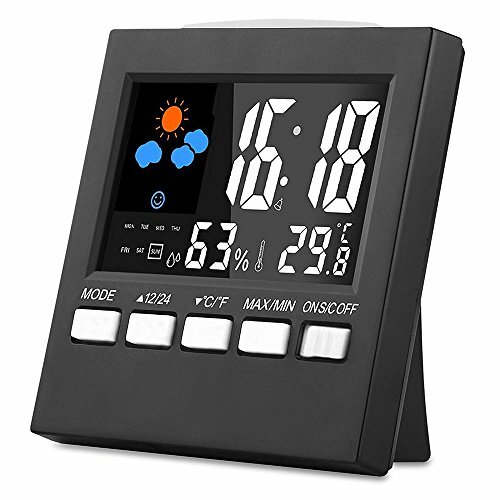 Support weather forecast, sound control function and sense light function.°C/°F temperature unit selectable, and 12/24 hour time display selectable.